I worked and played – at the same time. I joined a cruise ship excursion to check out their tour for a writing assignment. 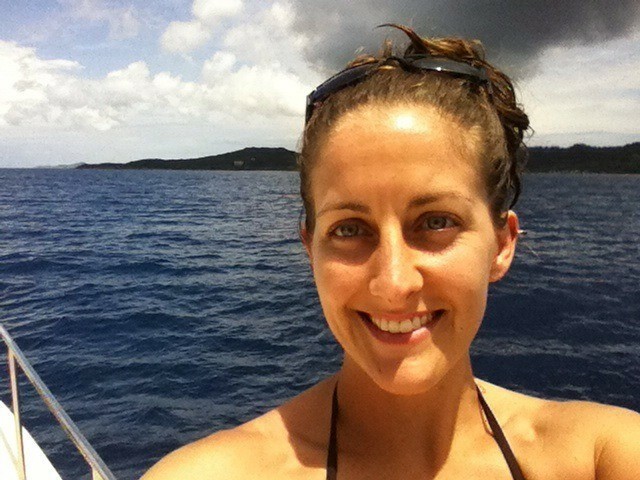 Getting paid to snorkel and enjoy a few hours on a catamaran? Um, yes, please! I made new friends. I chatted with a lovely woman and her two sons on this cruise ship tour – she was just so sweet and funny! I hope she had a fabulous time with her kids. I also got to know the guys who crew this awesome tour…and they were fantastic! What an amazing group. I soaked up sunshine and saltwater. Perhaps a bit too much sunshine if you ask my slightly reddish skin, but it was necessary. 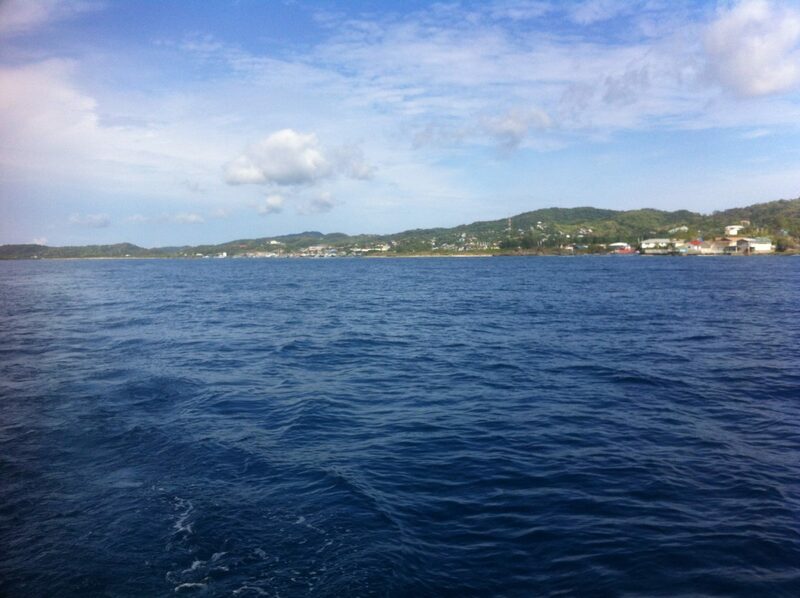 And I managed to snorkel and dive today – can’t beat that! I helped a friend conquer a fear. A night dive can be scary! I went on the dive because last year I promised my friend, Lisa, that I would hold her hand when she did her first night dive. Here we were, as she prepared to finish her Advanced Open Water certification with my Irish-Colombian at Roatan Divers, and so I kept my promise. When we knelt in the sand and turned out the lights, I held her hand to keep her calm. And she not only completed her new certification, but she did it with an incredible display of bioluminescence! What a dive it was! I cried tears of joy. The night dive provided us with the most incredible show! Bioluminescence is what happens when a firefly emits light, or in the example of the underwater world, when plankton emit light. A chemical reaction results in a bluish-green light, and when you are surrounded by innumerable little plankton, you are literally swimming in a sea of sparkling lights. To top that off, we saw an amazing number of String of Pearls, which Lisa compared to looking at the night skyline of New York City. When ostracods (little crustaceans sometimes called sea shrimp) are mating, the males emit a series of bright lights with their spiral movements to attract potential mates. We were absolutely surrounded by these strings of lights dangling in the sea like the falling embers of bright fireworks. It was so incredibly amazing that I couldn’t help but cry seeing such an astoundingly beautiful scene. I watched as sparkling lights emerged from my own hands and from the bubbles of air I breathed out. I felt sheer joy and wonder and never wanted that moment to end. If you’ve never witnessed this, it absolutely needs to become a new life goal. I laughed a lot. I laughed so much my sides hurt and my cheeks ached. I laughed with strangers and with friends, because what is life without laughter? I witnessed an entire community come together to help someone in need. A young boy left shore on a kayak at sunset, and he didn’t come back. As the wind and waves picked up and night fell, a search and rescue operation went underway. While this particular event carried over to the next day, it was an amazing effort put forth by the entire Bay Islands community to finally find this teen floating nearly 40 miles from Roatan the next morning. Dive shops sent their boats out and individuals volunteered their time and resources. The helicopters sent out from the Soto Cano air base on the mainland were the eventual rescuers, finding the boy safe and sound and bringing him home to his family. Seeing the whole community come together, reaching out through various channels to Honduran and U.S. officials on the mainland, Belize officials in case he made it that far, and every contact throughout the Bay Islands to mobilize efforts was heartwarming. Luckily for this story, there was a happy ending. Let it serve as a reminder that safety precautions should always be taken, because for all its beauty, the sea is more powerful and less forgiving than any of us can possibly fathom. I felt so very loved. During a day filled with so much emotion and activity, I felt so very loved by so many people. From my old friends I saw for the first time in a while, to the new friends I connected with, to being home with my favorite person in the world; this day was the best day ever. That is, until the next best day ever, which will probably be soon. I hope your days are always the best days ever, wherever you are. If you haven’t connected with me on Facebook yet, be sure to Like my page for more updates and other fun things that might not make it to the blog. I’m also on Twitter, Instagram, and Pinterest so let’s be friends there, too!